While no-one wants their cooking to be a catalogue of complete disasters, failure isn’t always such a bad thing. Experimentation – whether planned or otherwise – leads to innovation, and some of the world’s favourite foods can be attributed to the fortuitous mistakes of their creators – just think of Ruth Wakefield’s discovery of the chocolate chip cookie when pieces of chocolate in her Butter Drop Dos failed to melt properly. A world without the chocolate chip cookie would be a very sad place indeed. With Mother’s Day just around the corner (for any confused international readers, in the UK we celebrate Mother’s Day on the fourth Sunday in Lent), I thought it would be fitting to share a recipe inspired by my Mum. I’ve mentioned before her fairly puritanical approach when it came to puddings: sweet treats came fairly few and far between in the little loaf household, reserved for parties, special occasions or when we had important guests. However when my Mum did decide to allow us the indulgence of dessert, I remember them being amazing: perfect mouthfuls of rich chocolate mousse stirred through with coffee, incredible tiers of brown sugar meringue stacked with chocolate cream and raspberries, the best chocolate brownies in the world and, of course, her lime tart. This tart was such a staple of special occasions in my childhood that I just have to close my eyes and I can taste that smooth, sweet, slightly tangy filling, flecked with lime zest and held together by rich, buttery pastry. A simple recipe, as a littler loaf I made it with my Mum on numerous occasions. In fact we made it so often that, if asked, I’d probably have told you I could make it in my sleep. Unfortunately that’s simply not true, and last week when I actually did want to make a citrus tart, I had to email my Mum for the recipe . . . It arrived in my inbox, slightly faded from being scanned and accompanied by a note from my Mum advising that the recipe makes a very generous quantity of filling, so I should be careful when pouring everything into the tin in case it overflowed. While I can be an absolute perfectionist when it comes to baking, for some reason in certain areas I seem to adopt a slightly more cavalier attitude. I only own one loose-bottomed tart tin, a whopping 25cm diameter beast bought with one specific recipe in mind and, annoyingly, too big for the majority of recipes I’ve encountered since. However, with practice, I’ve discovered that I can eke out this simple pastry recipe (designed for a 23cm tin) to fit the bigger version, resulting in a wonderfully thin, delicate tart shell. Bearing in mind what my Mum had said about her recipe making plenty of filling, I kept the quantities the same, using just lemon juice rather than lime and assuming I’d end up with a lovely slim layer of lemon in my tart. I did, but to far too great a degree, the lemon so thin it barely came up the sides of the tart and left almost a centimetre of exposed pastry. I really wasn’t happy with the results, and in other circumstances I might have binned the whole thing in a fit of frustration, but this was Friday morning pre-work baking with Carniverous Boyfriend’s Mum arriving that evening to spend the weekend with us and I really didn’t have time to start the whole thing over. Instead I improvised, the surprising result of this recipe fail being a rather lovely, light lemon tart. 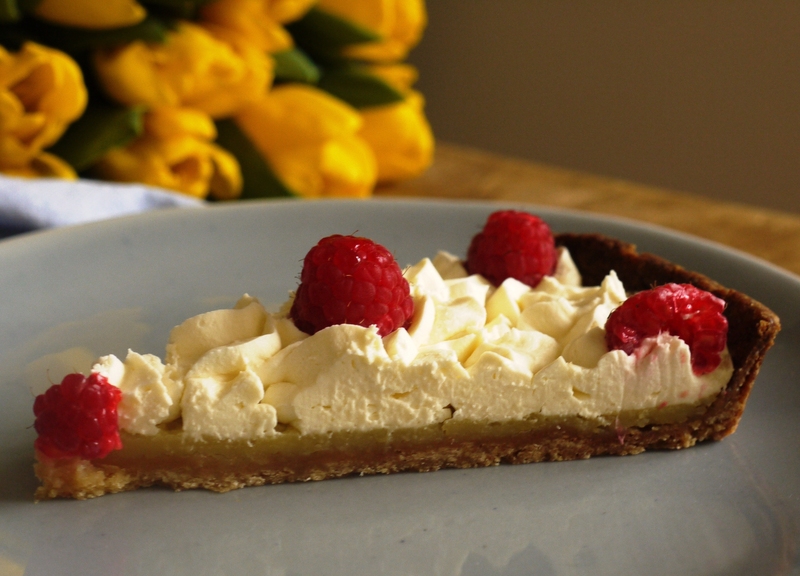 To compensate for the missing centimetre or so of sharp, citrus filling, I whipped together cream and mascarpone, stirred through a couple of spoons of lemon curd then piped creamy pillows over the top of my tart. This cloud of cream will hid a multitude of sins, but also made for a really very delicious dessert. Classic lemon tart it is not, but the combination of rich, tangy filling, smooth mascarpone cream and crisp, buttery pastry is unexpectedly addictive. We ate slices after supper that evening, seconds the following afternoon, and finished the last few mouthfuls on Sunday (after my last minute realization that I should really snap the lone slice which appears in the photos for this post), when the tart still tasted beautifully fresh and the cream held its pillowed peaks. 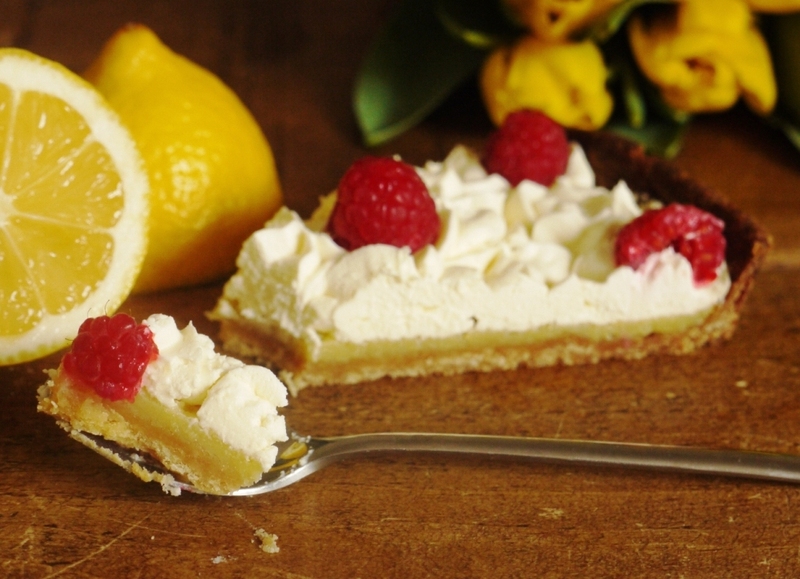 This is the perfect dessert to welcome in Spring, whether you’re celebrating Mother’s Day or simply looking for a slice of sunshine onto your plate. It’s simple and adaptable – you can make it with lemons, limes or even blood oranges as the mood takes you and flavour your pastry with herbs or spices: I’m thinking a lemon tart with a thyme crust and a lime version with chocolate pastry would both be pretty good. And if you like a thicker layer of lemon in your tart, simply bake the recipe below in a 23cm tin and add your mascarpone cream on top of that. It will result in a taller tart, but probably look all the more impressive for it. Unfortunately my Mum didn’t get to try a taste of this particular lemon tart – my parents were on holiday that weekend and it was so moreish that we spectacularly failed to save them a single morsel. But both the original and my cream covered adaptation are so delicious, I’m sure I’ll make them again soon. And I hope you will too. Place in the middle of a 25cm tart tin (or 23cm tin for a thicker tart, see note above) with a removable bottom and use the heel of your hand to press the dough right out to the edges and up the sides. Try to keep the surfaces as smooth as possible. Once the dough is evenly distributed, pop the tart shell in the freezer for one hour. When ready to bake, preheat the oven to 190 degrees C. Get your tart shell out the freezer and prick the base all over. Bake for 7 minutes (no need to line with beads) then give it a check. If the pastry is starting to puff up, push it back gently with a metal spatula, then continue baking for a further 10 minutes until a light golden brown. Turn your oven down to 180 degrees C, remove your pastry case and leave to cool. Whisk together the lemon juice and caster sugar. Add your eggs one at a time, whisking to combine, then whisk in the butter. Pour your filling into the tart tin and bake at 180 degrees C for about 15 minutes, until set. Set aside to cool. In the meantime, whip the double cream until firm peaks form. Stir through the mascarpone and lemon curd, then transfer to a piping bag with a star-shaped nozzle. Once the tart is cool, pipe the cream in concentric circles until the whole surface is covered. Dot with raspberries, if you like, and serve in thin slices. That way you can justify coming back for seconds. Which you will. That looks absolutely divine! Husband doesn’t eat cream or mascarpone, so now I’m having thoughts of mixing well strained Greek yoghurt with a bit of icing sugar and lemon zest and using that. A great salvage, and, a new dish is born! You’ll have to recreate it again just for your mum to see what she thinks! Lovely recipe. Would be even better with homemade Lemon Curd? Oh, Loaf! (I think I say that quite a lot). This looks amazing – such an incredibly well presented pie. Stop presenting everything so well! I’d say that it was an accidental success! Also, the thinner the pastry the better… I always break it a little though, I’m not nearly as delicate as you… I’d imagine. This truly looks wonderful. Jaime – thank you. 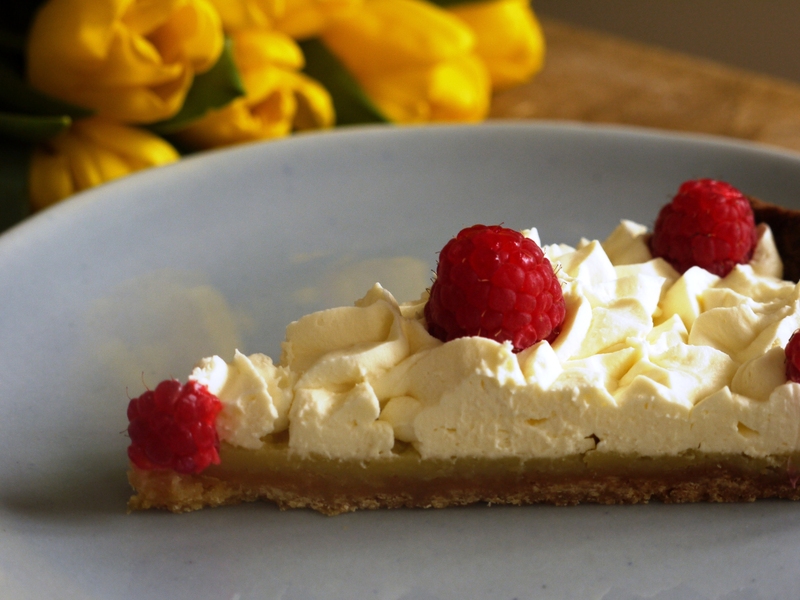 The raspberries work really well against all that cream too, cutting through the richness. Lisa – I think it would be lovely with yoghurt too – really tart and fresh. 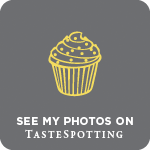 The SW Food Blog – I definitely will! Lorraine – the pastry was beautifully thin – I don’t like it too thick. that looks so good! i want to try this! What a beautiful tart and a lovely flavor! The filling looks so delicious and fluffy. Wonderful job! We are huge fans of lemon curd!! Cold lemon tarts are one of my favourites even if it didn’t turn out as you expected! Ah I’ve never thought of pairing marscapone cheese with lemon curd… how brilliant. Love this. Jereme’s Kitchen – you should! Amy – thank you! I do think the cream is important to – lightens it all up a bit. I fear I could devour this entire tart whole. Mascarpone and lemon are such pleasures for me. Love! OMG this looks great! loving the lemony layer. The combination of the lemon curd and mascarpone cream sounds delicious, sort of like lemon tart with vanilla ice cream. Glad you remember to take a picture! Yum! This is gorgeous! I just made something very similar last week, but with pomegranate added on. Kristin – haha, it definitely is very moreish! Nuts About Food – it was a close call – this was the very last slice and almost got eaten before I remembered to take some pics! Terra – homemade lemon curd is so delicious. Amrita – ooh, sounds lovely. Oh indeed we’ve all had kitchen mishaps, me more than most probably because I just can’t bring myself to follow a recipe. What a brilliant mishap for you though. Your tart looks delicious and I can vouch for the chocolate and lime version. The chocolate and lime mascarpone tarts I made last year were some of the most delicious things I’ve yet made. I’ve certainly had my share of kitchen mishaps, but when you can rescue a mishap that truly is a wonderful thing, and your tart indeed looks wonderful. I would have to say lemon tarts are one of my favourite desserts. Choclette – definitely need to make that chocolate and lime version! Jennifer – me too, lemon is so delicious in desserts, especially now the weather is getting warmer in the UK. Don’t you just love it when you avoid a mishap. 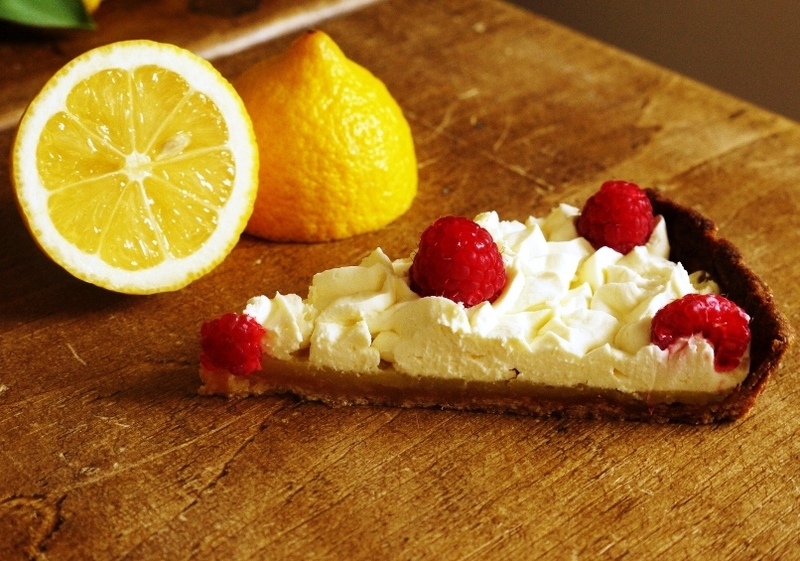 This tart looks so so good! the citrusy mascarpone filling sounds delish. Baker Street – thanks. It’s such a relief when you can patch something up, and possibly make it even better!